The regular meeting of the Board of Supervisors will be held in the Craig County Courthouse Court Room at 6:00 pm on March 1st, 2018. Please enter the Courthouse at the side entrance off Court Street, the Court Room is located on the Second Floor. You may use the stairs or the elevator. 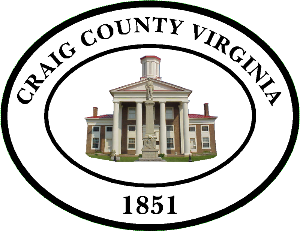 The Craig County Board of Supervisors will meet each month on the first Thursday of the month. Location: Craig County Courthouse, enter at the Court Street Entrance, the meeting is in the Court Room on the second floor. The Craig County Board of Supervisors will hold a Budget Work Session during their regular Board of Supervisors meeting on March 1, 2018. This work session will include a joint work session with the Craig County School Board. The Craig County Board of Supervisors will hold a Budget Work Session on March 15, 2018.